India is facing lot of communal-ethnic strife where the place of origin and religion of people is the marker due to which they are attacked. Many a retrograde political ideologies are based on the ‘first comer’ assertions. The deeper problems related to social resources, economic deprivations and socio-political inequalities are being presented as problems related region or religion of people. In Mumbai, one can see this in its extreme form, in the politics of Shiv Sena and Maharashtra Navnirman Sena (MNS). Both these outfits have a regional-religious chauvinist agenda. They switch from region to religion at the drop of the hat. They also keep combining the two in the aggressive street politics. The rising star of this sectarian politics, Raj Thackeray, has been in the news for all the wrong reasons, threatening ‘others’ with his usual ‘methods’ of ‘direct action’. Why the state lets the ‘direct action’ of these sectarian outfits go unpunished, is another side of the coin of the story. Recently (Sept 2012) when the Bihar official wrote to Maharashtra police authority that Maharashtra police should have informed the Bihar police before arresting the two criminals who had broken Amar Jawan Jyoti in August 11, 2012 violence, Raj Thackeray retaliated by saying that MNS will declare all the Biharis as infiltrators. As such what Bihar police was asking was a mere routine followed by police of one state while acting in the other state. Thackeray, in order to bake his political bread made it an issue. While he was talking in this language, an interesting point came up. Congress General Secretary Mr. Digvijaya Singh dug out some history from the writings of grandfather of Raj Thackeray and father of Bal Thackeray, Mr. Prabodhankar Thackeray (?Thakre). 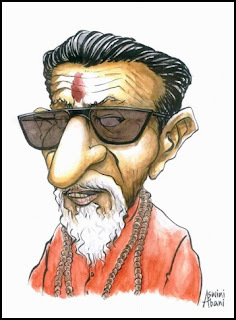 Incidentally the spelling Thakre was changed to Thackeray not too far back in History. Singh quoted Thakre senior’s collected works, Prabodhankar Thackeray Samagra Vangmay: Khand (Volume) 5, published by the Maharashtra Rajya Sahitya Ani Sanskritik Mandal when BJP-Shiv Sena was ruling the state. This quote is about the geographical background of the community from which Thackeray’s come, Chandraseniya Kayastha Prabhu (CKP). Singh quoted page no. 45 of the volume 5, which says that Magadha’s corrupt Kshatriya king Mahapadmanand was persecuting his subjects by levying various taxes on them. Many a families from CKP community left Magadha to escape the persecution and greed of Kshtriya ruler and left for Nepal, Kashmir and Bhopal. The same book mentions that out of those who left Magadh (now Bihar), around 80 families settled in Taal Bhopal and Prabodhankar’s family was one amongst them. As per Singh, Prabodhankar mentions that the Muslim ruler of Bhopal was very kind and was great help to the Thackeray family. This Thackeray family later migrated to Mumbai. Uddhav Thackeray, cousin of Raj and son of Bal Thackeray, said his grandfather is generally talking about the CKP and not his family in particular. Still Uddhav did not give the alternate version of their families past. Interestingly Parabodhankar’s account breaks another myth. Today his descendents and the practitioners of sectarian politics propagate that the medieval period was a dark period of India as there were many Muslim kings and Nawabs, who were doing atrocities on Hindus. Their version also glorifies Hindu Kings in general. Here in Prabodhankar’s account, a Khstriya (Hindu, warrior caste) king is tyrannical forcing the subjects to leave his kingdom while the Muslim Nawab is helpful for Thackeray family. Stereotyping the kings as per their religion, communal historiography has played a very negative role in the history of our society. In Pakistan and India both, even today such perceptions are part of popular understanding. There is a need to learn from what Thackeray senior writes in his book. How do we judge citizenship today? Do we have a right to go from one state to another or not? Theoretically it will be accepted by all that it is legally correct. Still in various places and more particularly in Mumbai, Shiv Sena and its clone MNS have been creating havoc on this issue. Their sectarianism is not restricted only to region, but also to religion. In both matters their basic understanding is also totally fabricated and far from truth. As migrants have been taking place in to Metros, big cities, depending on survival opportunities. In pre independence times major migration took place amongst other places to Kolkata in particular. In Mumbai in the decade of 1960s to 1980s, when industrial production was booming here major migrations took place. And the major migrations to Mumbai did not take place from outside Maharashtra. They were from mainly Konkan region of Maharashtra. Even today the migration is taking place, the major migration is to Delhi and Punjab, Mumbai is third on the list. The latest Tata Institute of Social Sciences report tells us that 70% of immigrants to Mumbai are from within Maharashtra itself. In these migrations employment is the reason only for 15% of those coming here to Mumbai. The major reasons for coming to Mumbai are related to such migration being a post marriage relocation and education. Currently Thackeray family, the original inhabitants from Bihar in the past, are pursuing their spewing of venom against Biharis in particular. Their targets have been changing. The Shiv Sena was propped up by the Mumbai industrialists to break the strength of workers unions. Shiv Sena was then subtly helped by the ruling Congress. Shiv Sena initially attacked the South Indians, with the slogan ‘Uthao Lungi Bajao Pungi’ (Beat up the lungiwallahs, South Indians). Then their targets shifted to Gujarati’s for time being. In between Shiv Sena also postitoned itself on the bandwagon of Hindutva politics of RSS, and took the lead in 92-93 Mumbai violence with slogans like ‘Muslaman ka Do hi Stan: Pakistan ya Kabristan’ (Muslims can have only two abodes: Pakistan or graveyard). They demonized the Muslims, all this has come out in the Srikrishna report, which is yet to be implemented in letter and spirit. Lately, North Indians are the major targets of the politics of regionalism. This Shiv Sena-MNS politics is totally against the norms of our Constitution. The aggressive politicians also need to present the reality in an honest manner. If 70% of immigrant to Mumbai are from Maharashtra are Marathi Manoos,(Marathi speaking people) what do you do with them? There are problems. But the problems are not with Biharis or Nepalis coming here to explore survival options. The whole concept of development and the state polices need to be organized in a way where some areas don’t get burdened by the pressure of population. The victims of politics based on region and religion are the poorer lot, while in later case the poor rich divide has been abolished during last two decades. At another level, religion, nation state, and regions are concepts which should help the humanity grow. Spencer Wells has shown that genetic lineage of the human race goes to Africa! Nation state is the concepts, which came to overcome the tyranny of the kingdoms. Nation states have a contribution for human society, only in so far as they bring in democratization of society and do away with feudal values. Regions in a nation state are meant to provide mechanisms for regional growth and barring that they should be fluid and inclusive in all sense of the word. The ilk of Thackeray needs to learn the moral of story from their lineage. It will do us good if they can also learn a bit from Tagore’s universalism and Spencer Wells theories about migrations of human race. Is ‘Hindu’ our identity and Nationalism?